As more users are upgrading to SQL 2008, they are running into some of the small changes in the 2008 management studio. 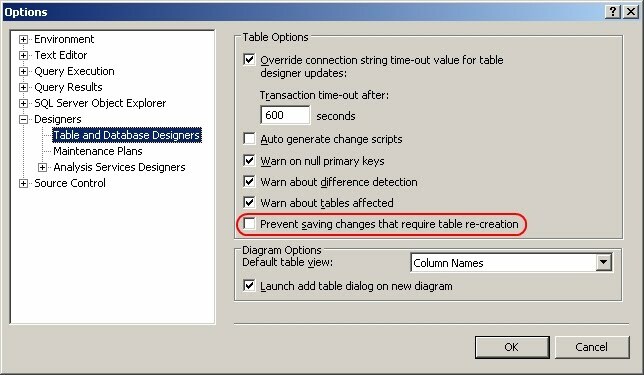 This may fool you or the user into believing there is a permissions issue preventing the table being updated, but it's actually a setting in SSMS - presumably to prevent the application hanging if the table involved was of any significant size. The fix though is to simply uncheck box in the Options window. Select "Tools" from the SSMS menu bar, then "Options..." from the drop down list. 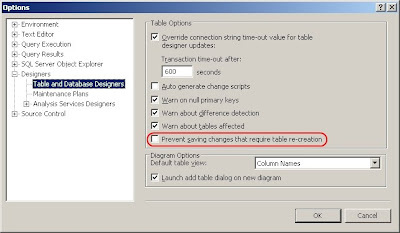 Expand the "Designers" section, and under the "Table and Database Designers" section, you should find the "Prevent saving changes that require table re-creation" option, which you can disable. Or you could just learn how to use ALTER TABLE statements in T-SQL!